Send loving reminders of the great state of Wisconsin to family all over the United States. 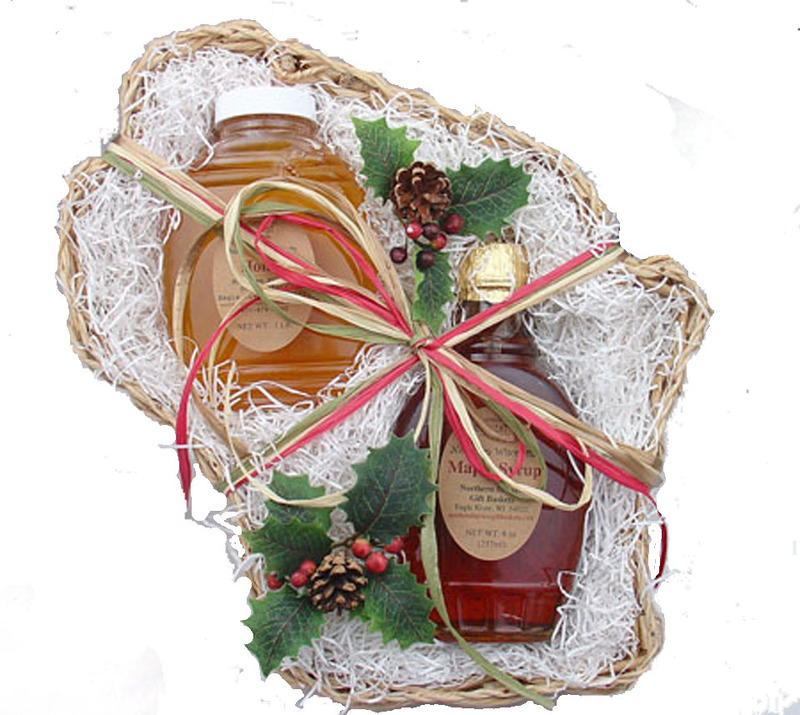 If you would like to customize a basket, contact us with your ideas. This willow basket is filled with everything for snacking. 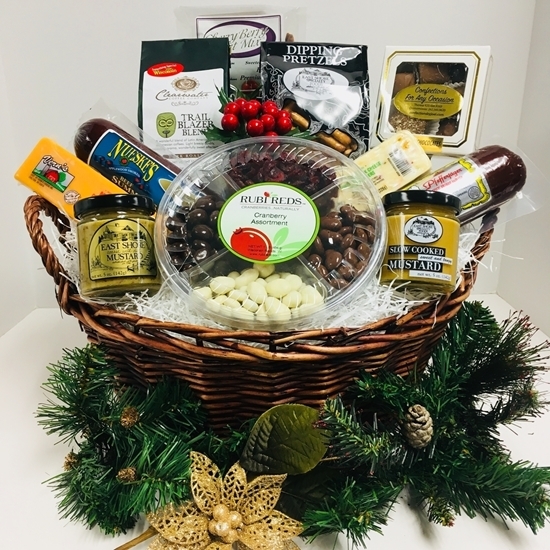 Two full size cheeses, two full size sausages, gourmet pretzels with gourmet dips, dried fruit and premium nuts, an assorted wheel of chocolate covered craisins, an assortment of delicious hand dipped chocolates all to be enjoyed with freshly roasted coffee. 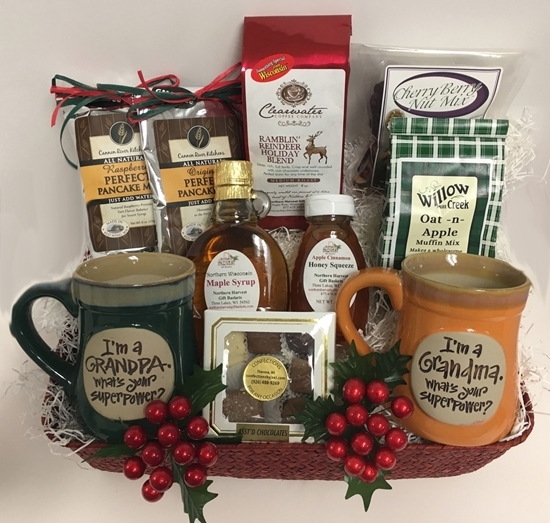 Spoil your grandparents with treats that are sure to please. Start the morning with fresh brewed coffee in a personalized mug, hot pancakes with warm maple syrup, or muffins and honey. A breakfast they will surely thank you for. 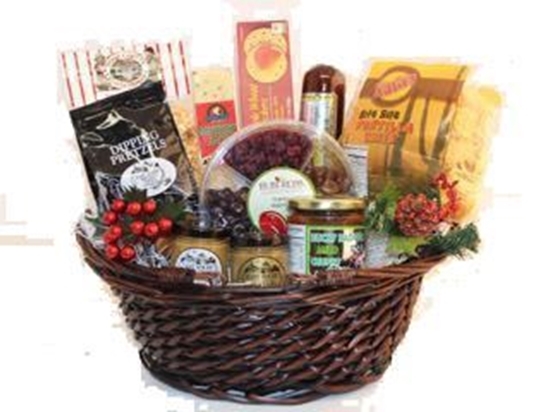 All the Best of Wisconsin Gift Basket is a perfect sampling of some of the gourmet foods that make Wisconsin famous. 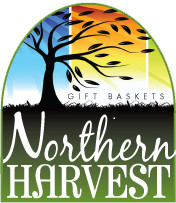 This gift basket by Northern Harvest Gift Baskets is full of a delicious variety of our gourmet favorites in an open weave basket with handles. 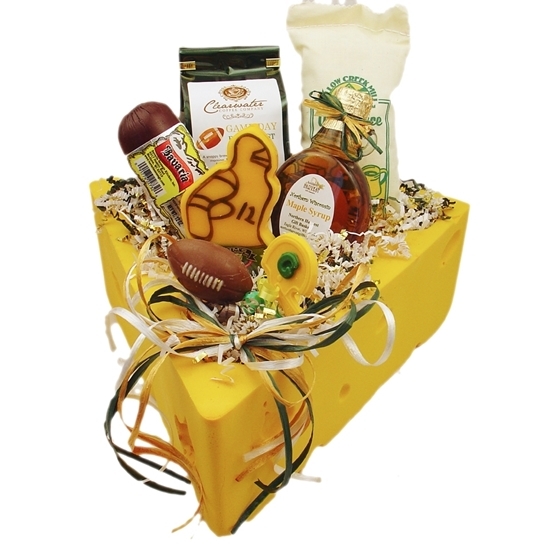 Wisconsin is known for its cheese and sausage, and this basket showcases both. Spicy sausage and pepperjack cheese on gourmet crackers is a great combination. The pretzels dipped in tangy mustard or dill mustard can't be beaten. And don't forget the tortilla chips and salsa. Continue the flavor excitement with Door County's Caramel Nut Corn and the sweet treat of three different chocolate covered craisins. 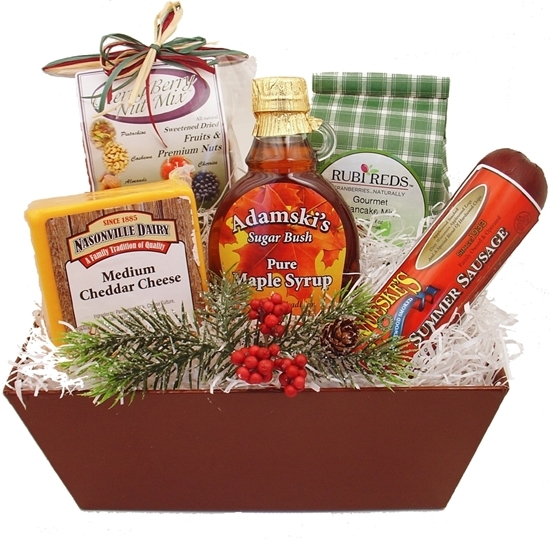 All the Best of Wisconsin Gift Basket is a great gift idea for the holidays or any time of the year. Great as a corporate gift. 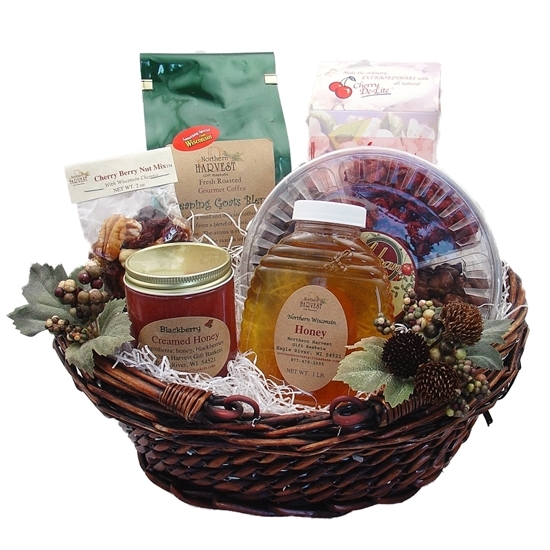 A beautiful willow gift basket is loaded with outstanding Wisconsin gourmet products. 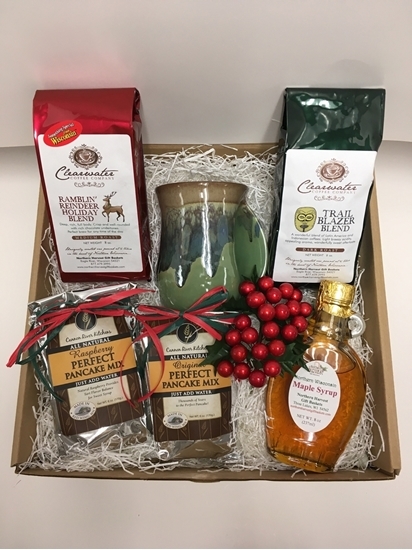 A perfect gift for friends and co-workers or family members. 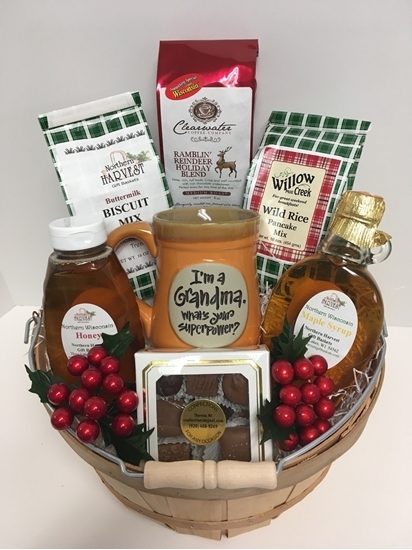 Spoil your grandma with treats that are sure to please. Start the morning with fresh brewed coffee in a personalized mug, hot pancakes with warm maple syrup, or biscuits and honey. A breakfast she will surely thank you for. 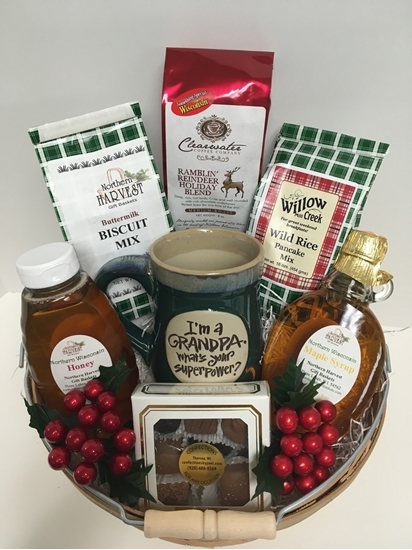 Spoil your grandpa with treats that are sure to please. Start the morning with fresh brewed coffee in a personalized mug, hot pancakes with warm maple syrup, or biscuits and honey. A breakfast he will surely thank you for. 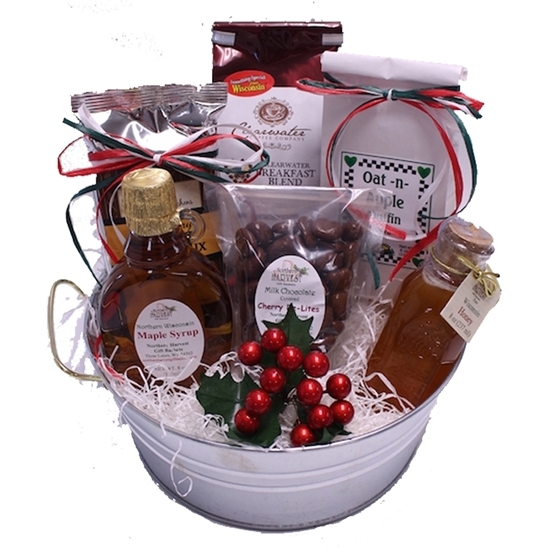 A festive bucket filled with Wisconsin's best products. The perfect sweet start to your morning. 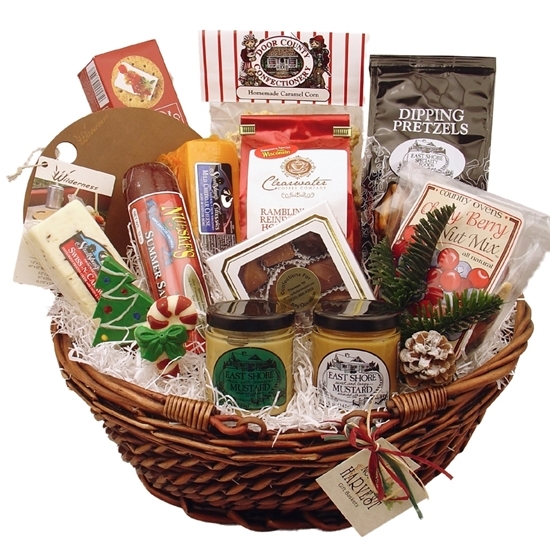 Wisconsin boasts having many delicious foods and this basket has some of the best. Starting with the breakfast pancake mix and syrup to the cheese and sausage for later in the day and ending with a sweet mix of cherries and nuts, you'll experience the best of Wisconsin. Keep your hands wrapped around this handmade mug to savor a perfect cup of coffee while enjoying fresh pancakes.